Combining biology, history, and a little humor, the author of this amazing new book presents a different view of the world as we know it. Sixth graders, especially boys, will get a kick out of the idea that insects had such a huge influence on history. Information is presented in small digestible doses with clever section titles (e.g., “The Buzz on Locusts”). The author begins with a quick biology lesson on what an insect is. She then proceeds to the many facts of hygiene and some of the more unusual edible insects. 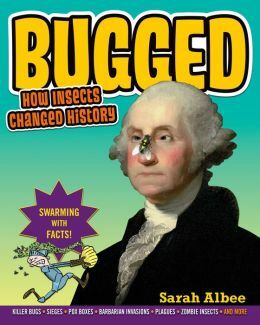 Most of the rest of the book goes chronologically through human history, highlighting each event in which insect-borne disease or blight played a major role. Many examples of invading armies either being overcome by local insect-borne illness or introducing a new illness were shown to decide the conquerors. Valuable insect-related products helped decide where conquerors wanted to go. Cortes was so taken with the dyes used by the Aztecs, and derived from insects, that he hung around to learn their secrets. Countries outside of China tried for hundreds of years to find the secrets of silk. Leighton’s sketches and choices of photos add a fun dimension to the project. Bugs with muscle power. Bugs chomping on the Roman Empire. Bugs inside caskets labeled malaria. Added bonuses include a table of contents, glossary (helping with comprehension), further reading and surfing (literacy skills), notes on sources, picture credits, and index. The author’s website, http://www.sarahalbeebooks.com/, has more information and reading activities.